March is International Women’s Month and we’re celebrating the talented woman who help make our games a reality. You may know some of them already from interactions in person at conventions or online through emails, but there are certainly a few faces you haven’t met yet. All of these superstar women are absolutely vital to our team and are a big reason our games have such high quality, from the production to the gameplay. You probably know Sara already! As our Director of Sales and Marketing, she attends most of the trade shows and is one of the regular co-hosts of the Renegade Society Radio. 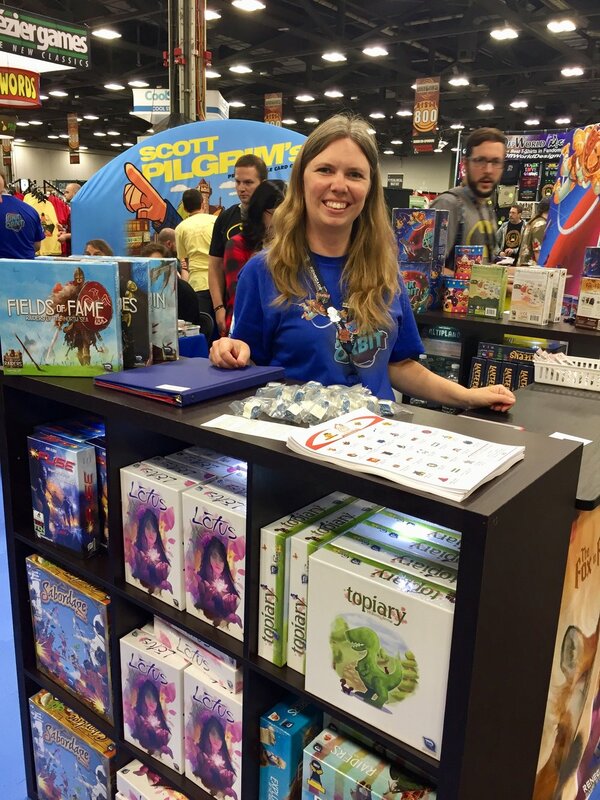 She makes sure our games are front and center in retail stores and helps create the buzz around new releases online. Fun fact: She loves animals and would love to talk to you about her dog, cat, bees, chickens, and poison dart frogs! Fun fact: She plays the cello and enjoys accompanying her children while they play their own instruments! Ask her about her musical cat, too! We have some seriously beautiful games in our catalog. Most of that is thanks to Anita’s sharp eye for detail and creative ideas for design! As our Creative Director, she manages a huge team of graphic designers and artists to create everything from logos and card art, to convention banners and images like these ones here! Fun fact: She lives in Costa Rica and has an outdoor office! The fresh air must really help get those creative juices flowing! Leisha is mostly a behind-the-scenes actor. You may have seen her at Gen Con (in the kitty ears! ), but she otherwise works her magic by keeping everyone on a tight schedule as our Director of Operations. Missing deadlines is a no-go with Leisha around! When she’s not sharing dates and scheduling shipments, she’s facilitating production with our factories (sometimes in person) to make sure everything is exactly as we want it. Robyn is someone the entire team is thankful for. Not just because she handles all of the mathy details surrounding our finances as our Controller, but because she never fails to bring a smile to our faces. Handling the mathy details helps too, though. Fun fact: She’s working towards visiting all of the Disney parks in the world! All that’s left on her bucket list are the Tokyo and Paris parks. Hopefully 2019 will be her year! This hobby has made several strides in guaranteeing that gamers of all walks of life are welcomed. We can see that clearly in the amount of amazing women we work with in the game industry, from graphic designers and game designers, demoers and press partners, to retail stores and distributors. Make sure to show your appreciation for all the wonderful women who touch your life! 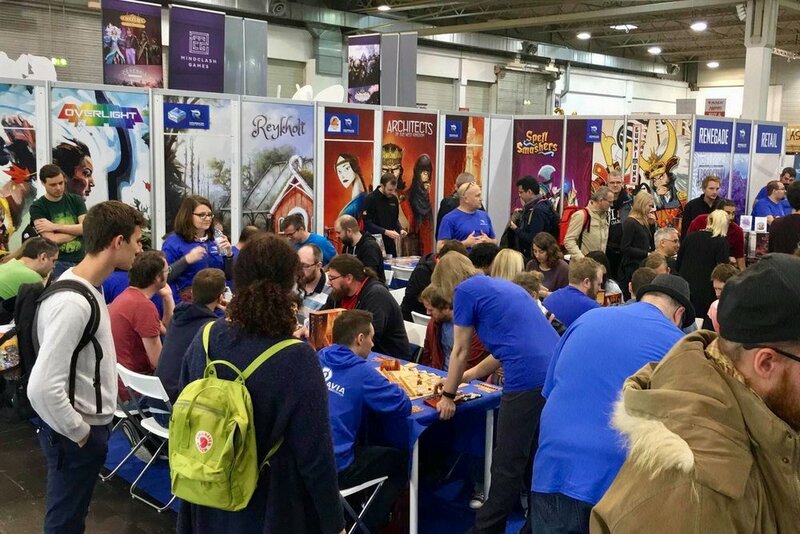 With thousands of games releasing and thousands of people rushing to buy them, Essen SPIEL is always an exciting time. This year’s show was the best one yet for the Renegade team! We had a small booth in 2017, but this year we increased the size of our space so much that we had two booths in two separate halls! We had many demo tables full of gamers at our main booth in Hall 2 playing our newest releases for 2018. However, the most popular tables were by far for our Fall releases. We had two tables of Architects of the West Kingdom, Arboretum, and Reykholt at all times. Sam Macdonald, one of the designers of Architects, even ran demos of his game every afternoon! We had a smaller booth in Hall 1 that we used exclusively for our titles designed for younger players. Dubbed our “cute booth”, we had colorful tables, stools, and our adorable dexterity games available for demo. 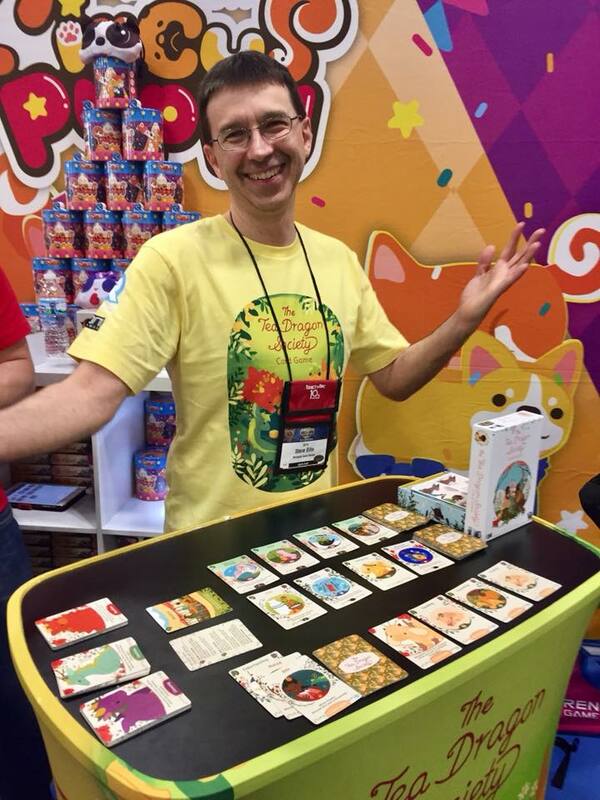 The biggest hits at this booth were The Tea Dragon Society Card Game, Kitty Paw, and Spy Club! Of course, since it was the weekend before Halloween, the team had some fun too. Reykholt got some love with a couple farm characters and a Tom Vasel doppelgänger was sighted at our booth! We spent last weekend in beautiful Vancouver, British Columbia at SHUX 2018! 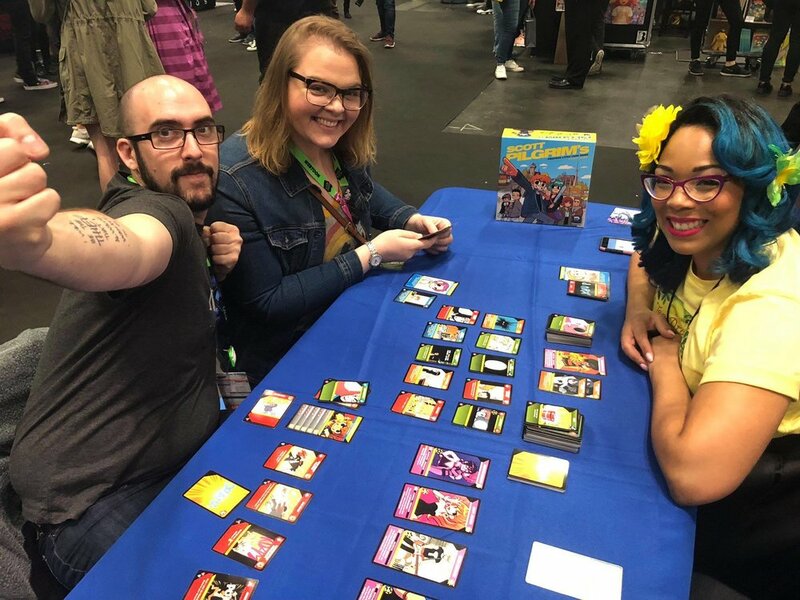 Shut Up & Sit Down are some of our favorite reviewers, so we were super excited to attend their second annual Expo, show our support, and play some games! We were one of many exhibitors at the show who were focused on teaching games to attendees. A local Vancouver game store, Starlit Citadel, partnered with us to sell our games and they had an impressive selection of the Renegade catalog! 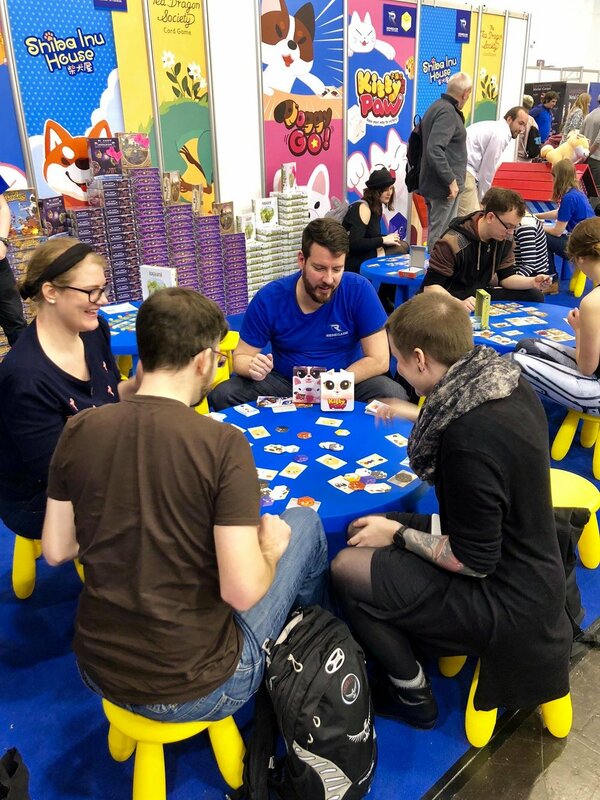 In addition to demos, attendees were able to check out games from the SHUX Game Library, attend panels given by SUSD members and Special Guests, and buy awesome merch to support the show! We had four tables of demos (Spell Smashers, Bargain Quest, Gunkimono, and Arboretum) that were full practically all weekend. The only time our demoers experienced any lull was at the end of the day when people left to find food! We chose to feature upcoming releases and titles that had previously earned the approval of SUSD. We ran two events over the weekend - an Arboretum tournament and a Spell Smashers tournament. Check out the winner’s impressive Arboretum! Those Maple trees definitely earned him mega points. We had two winners for Spell Smashers! They opted to smash some spells together in celebration instead of the traditional victorious high five. All in all it was an excellent show and we’re already looking forward to next year! The next show that you’ll find a bunch of Renegades at is SPIEL in Essen, Germany from Oct 25-28. See you there! Though Renegade is a San Diego Comic Con veteran (perks of being local! ), this was our first time exhibiting at New York Comic Con. It was a great show with lots of demos and fun had by all. Read on to hear about our adventures every day! This was setup and game learning day! It didn’t take us very long at all to set up our booth. We only brought four titles, since we expected attendees to be new to the gaming world. 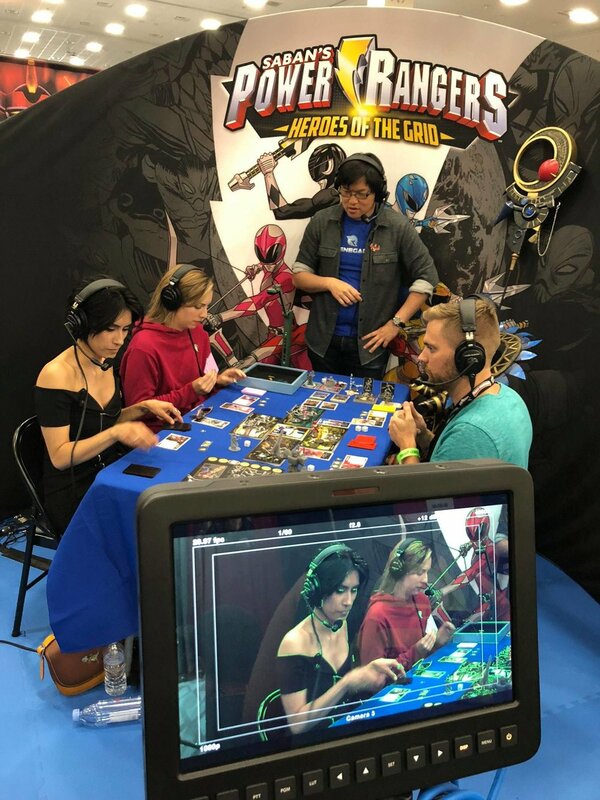 We had The Tea Dragon Society Card Game, Ghostbusters: The Card Game, and Scott Pilgrim’s Precious Little Card Game available for purchase and demo, while Power Rangers: Heroes of the Grid was only available for demo. After getting everything ready for the weekend, we grabbed a bite to eat and spent the rest of the evening learning games together! Nothing like team bonding before the chaos of an open exhibit hall! As soon as the exhibit hall opened, the rest of the weekend was an absolute blur! Time flew by in a whirl of games, cosplays, and hordes of fans stopping at our booth. We were situated right across from our friends at Oni Press and BOOM! Studios. It was perfect to be able to send people back and forth between our booths. We would talk about our games and recommend they check out the corresponding comic series. Fans of the comic or artwork in Tea Dragon Society and Scott Pilgrim would stop by constantly to learn more about the game. 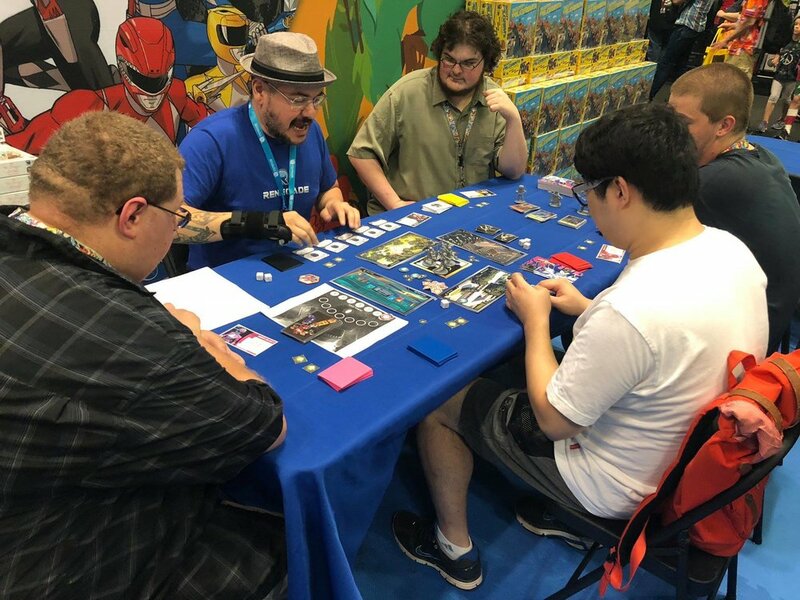 The demo table with our Power Rangers: Heroes of the Grid prototype was full all the time too! We had a lot of backers of the game stop by to try out the gameplay. It was really special to interact with fans who supported our biggest project yet. We even recognized a lot of them from the Heroes of the Grid Facebook group! Everyone left with a smile on their faces, even if they didn’t end up beating the boss monster. 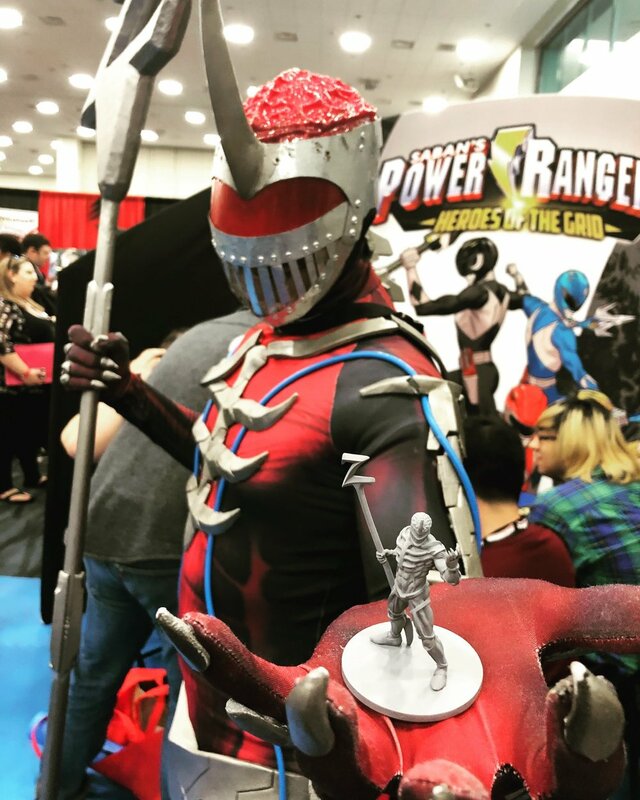 We had a blast playing with all sorts of Rangers, and even got some Putty Patrollers excited about the game too! Of course, since we were in NYC, there were a bunch of Ghostbusters everywhere! We tried to catch hold of as many as we could find and show them the game! After playing, most picked up their own copy! They ain’t afraid of no ghosts! 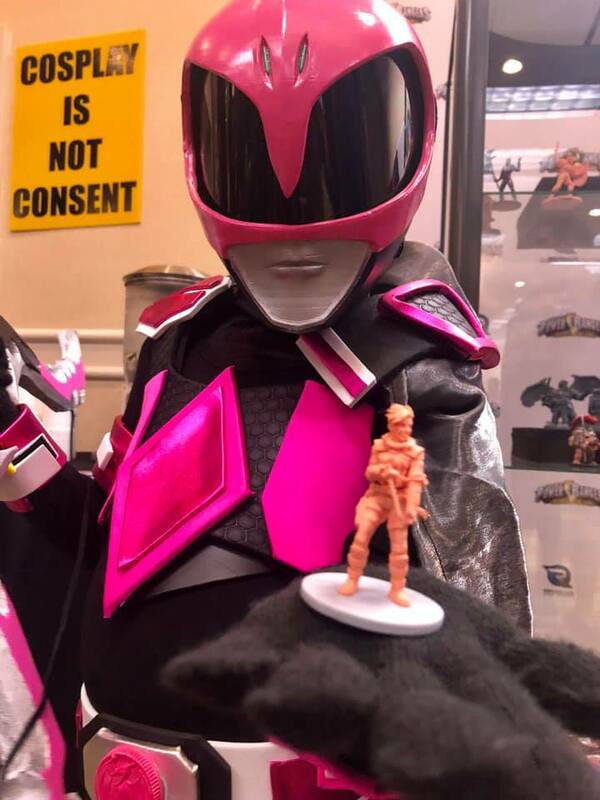 Power Morphicon was an absolute BLAST! 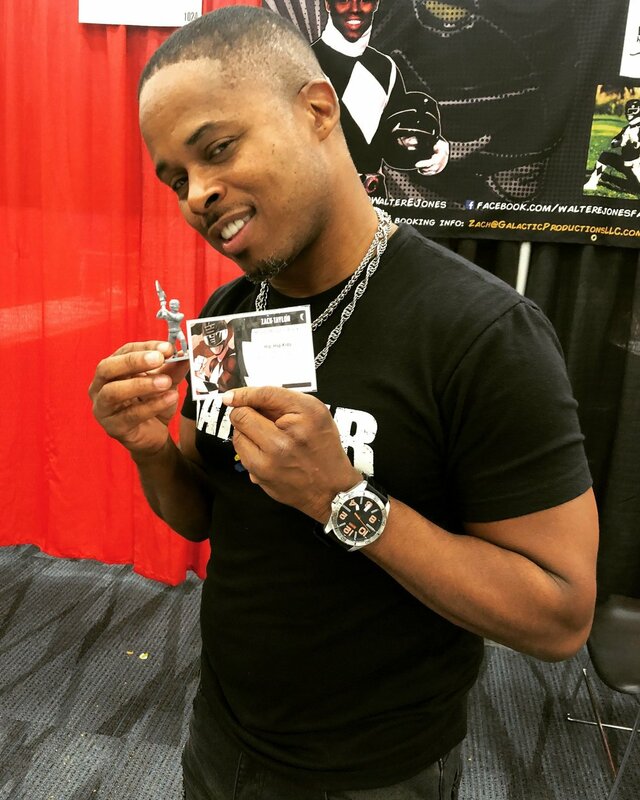 We can't tell you how much fun it was to meet so many Power Rangers fans in person. 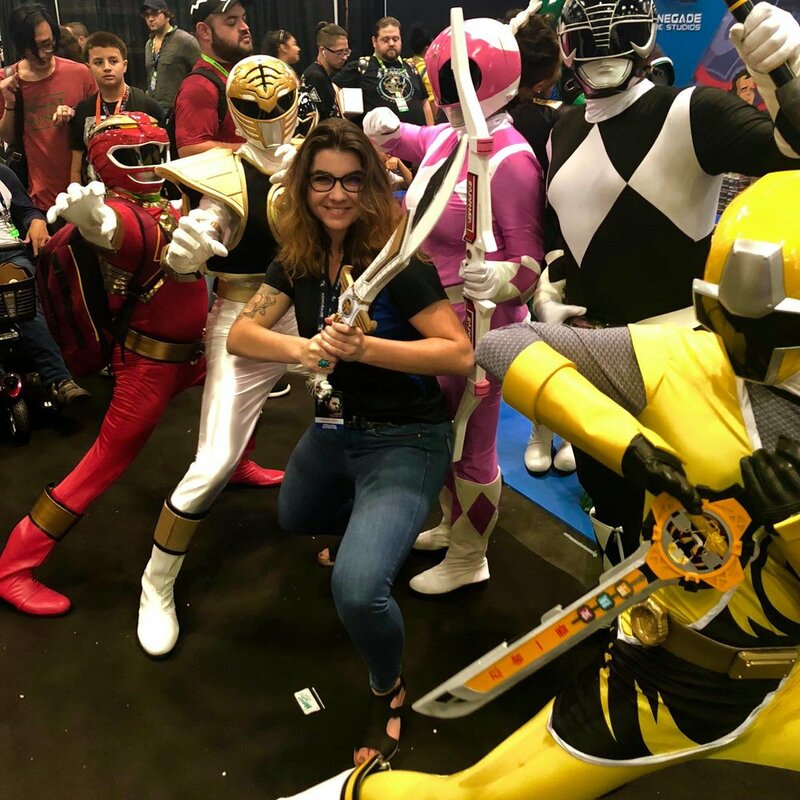 We were able to sit down with hundreds of fans and play through our game, get feedback, chat about figures, and generally geek out about how much we love the Power Rangers universe. It was so refreshing to see how fans took the lessons learned in the show about inclusivity, friendliness, and teamwork and applied it to their own lives. We spent all weekend teaching Heroes of the Grid to fans and press. The cast from Hyper RPG played through a full game, facing off against Bones, Madame Woe, and Rita Repulsa! Watch both thrilling episodes here! "Great artwork and awesome sophisticated gameplay!" "I really felt like a Ranger." 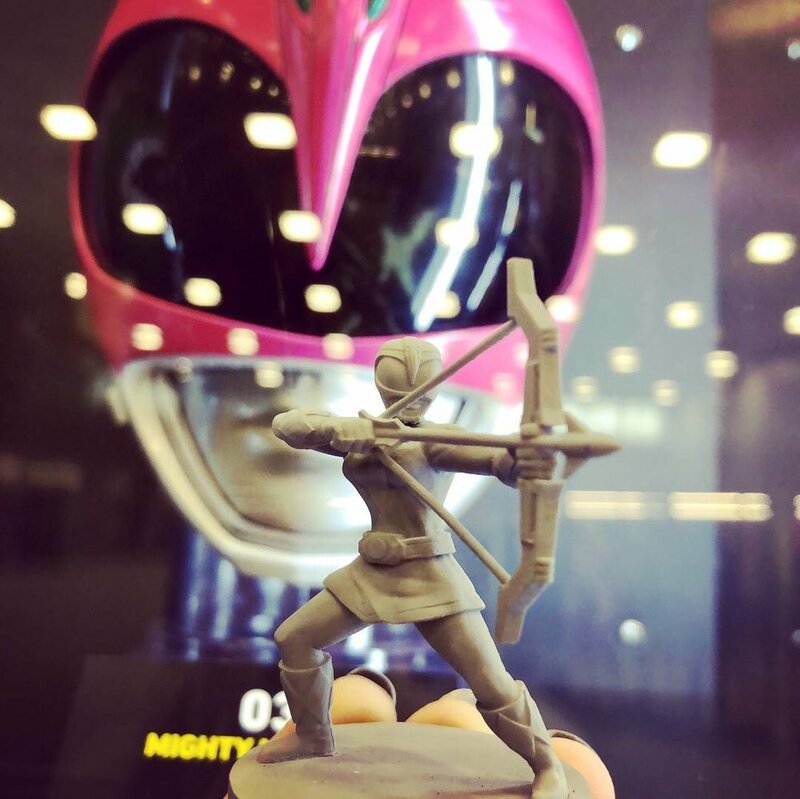 "I really enjoyed how the smaller achievements, defeating the Putties, contributed to a bigger reward in the form of a Zord." "The figures look amazing, the gameplay is fast and exciting. I can't wait to play all the expansion! It's Morphin Time!" "I like that it's easy to pick up and play and that you can mix and match Ranger teams." "I like the cooperative aspect of the game. Working together against the bad guys really feels like the show!" 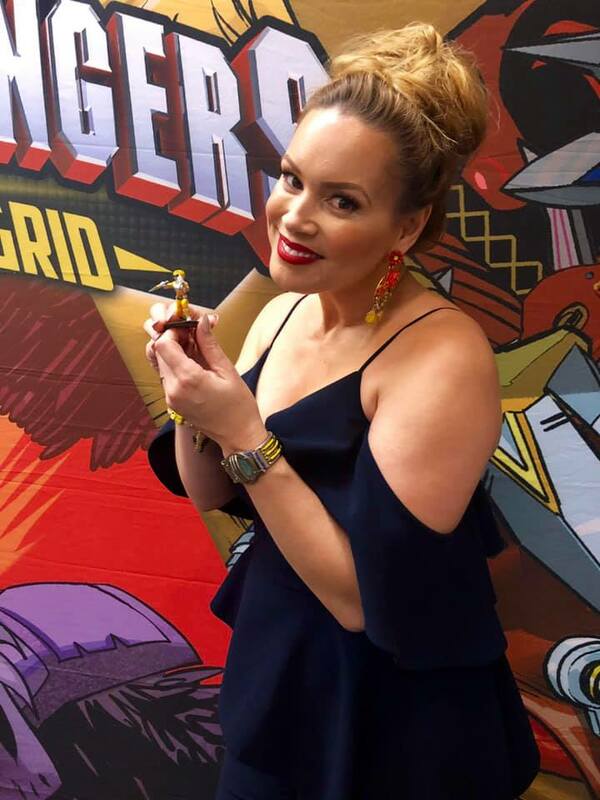 For more updates on Power Rangers: Heroes of the Grid, join the Facebook group! We share news, pictures, and conversation about the game and more! The Kickstarter only has 16 more days and lots of stretch goals left to unlock! Go go Power Rangers! Tuesday was a travel day for the whole team. We caught flights early in the morning to make sure we would arrive in time to catch up with everything that had happened since the last big show. The entire Renegade team works from home, so we enjoy any chance we get to spend some time together in person. Once everyone was in town, we met David and Jeremy from Man Vs Meeple for dinner downtown. Dan and David geeked out together over illustrations we had just received for our upcoming releases while Sara and Jeremy discussed exciting collaboration opportunities for the rest of the year. We can’t talk about these things yet, but look forward to announcements soon! Wednesday was booth set-up day. We have an awesome team of demoers who were eager to make the booth like beautiful. We worked together to lay the foam tiles to make our floor, wrangled crane operators to lift our hanging banner, and built shelves to store our many, many games! After all the hard work was done, we spent the rest of the day learning how to play the games we wanted to focus on. There were many sessions of Altiplano, Junk Orbit, Tea Dragon Society, Lucidity, and Prowler’s Passage going on as we put our heads together and nailed down the rules. Our booth also had a special guest! We made a special corner for Alfonso, a giant version of the first player alpaca in Altiplano! Matt, one of our demoers who happened to be assigned to Altiplano the entire show, brought goodies for everyone, including Alfonso! So thoughtful! Please note: Alfonso was not fed any Alpaca resource cookies. We do not condone Alpaca cannibalism at Renegade Game Studios. Once the show opened, the days were a blur! We rocked a different game shirt every day, just like we rocked our demos! We had three different areas at the show: booth, event area, and RPG room. The booth was where we held demos and sold our games. It was busy, busy, busy! Our event area was right across the way and had scheduled Clank! Tournaments and other How To Play events throughout the entire weekend. Our RPG room was a new addition this year, but worked out fabulously! Players were able to enjoy a quiet space where their imaginations could run free in the worlds of Overlight and Kids on Bikes. We sold out of a few of our titles, thanks to the awesome job our team was doing! Psst! Keep your eyes peeled on our social media pages! We have giveaways planned for some fun items I asked them to sign at the show. 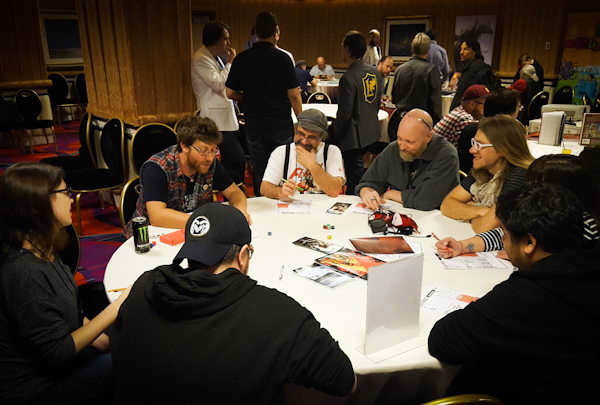 On Friday night, the backers of our Origins VIP Party for Overlight got together to spend the evening with the creative minds behind the RPG. Paul and George went over the world setting, game play, and their inspirations, while Kwanchai stared adoringly at his muse. Of course, big adventures require a lot of energy, so we all went out for a scoop of Jeni’s at the end of the night! Saturday night brought with it the annual Origins Awards ceremony. We had four (4!!!) titles nominated in two different categories. We had our fingers and toes crossed for all of them. Our hearts were beating fast as the winning title was being announced, our focus pinned on Jeremy and David of Man vs Meeple who were hosting the ceremony. 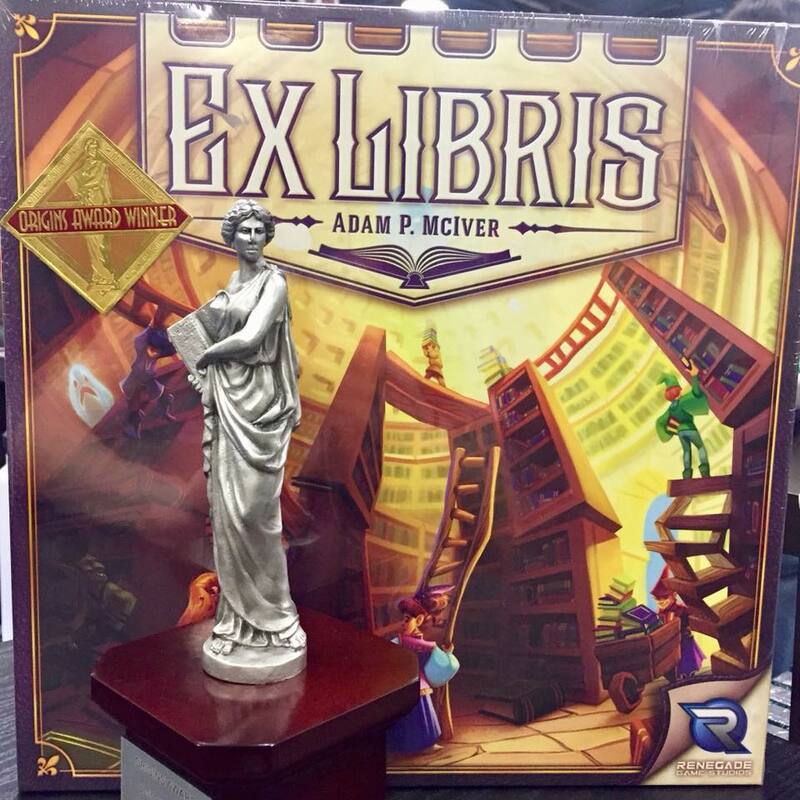 We erupted in applause as Ex Libris was named the winner of the Best Card Game category. It definitely deserves it! On Sunday, the hall closed early so we could start packing up our booth and head out before dinner time. We put our heads and hands together to get everything done ASAP. By the end of breakdown, we were all tired (even Alfonso! ), but we rallied and spent one last dinner together. Of course, we had to get another taste of Jeni’s, then while still on our sugar- and post-show-high, we played games together late into the evening. By Monday morning, most of the team was headed home, but the Renegade staff stayed behind to spend all day planning amazing things for the upcoming year. We played prototypes, discussed our next big events, and developed plans and programs for our fans! We’re so looking forward to seeing your reactions as we announce things! Our next big show is Gen Con! Our booth is going to be even bigger and better!! In fact, we’ll have two spaces. Our booth in the Exhibit Hall is #2209, at the corner of the Family Fun Pavilion. However, we’ll also have a large area in the Event Hall. This is where you’ll need to come to pick up your Gen Con Pre-Orders! We’ll be doing sales in our booth, but since by preordering, you’ve already paid for your items and no longer need to stand in line, go straight to the Event Hall to grab your games! Every May we make our way to Madison, WI for the ACD Games Day retailer event. 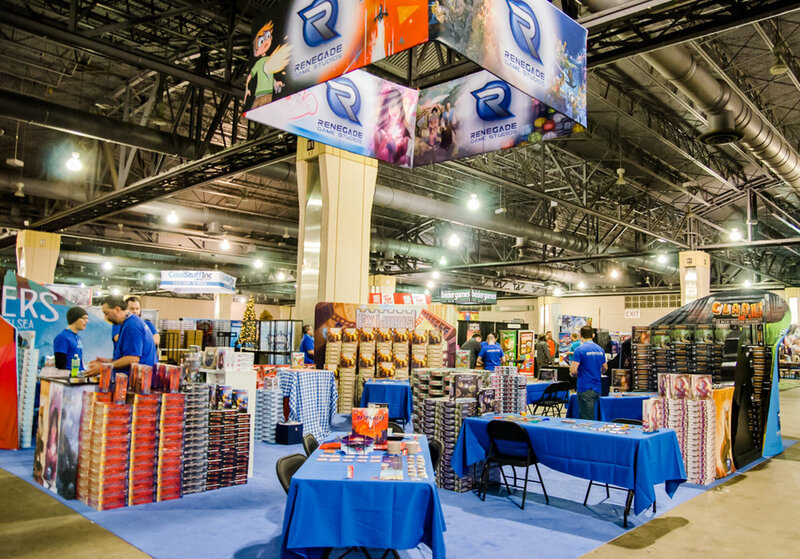 This event, hosted by one of the biggest game distributors in the US, welcomes retailers to attend insightful seminars, play countless new games, and loot the warehouse to find sought-after titles. We always have a blast contributing to the excitement. Read on to find out what the Renegade crew was up to at the show! Look at all that junk! Look at all those smiles! Sara arrived the day before the show opened to set up the booth and make sure things were prepared for the coming days (thanks, Sara!). In her free time in the evening, she visited one of the local game stores, I’m Board! Games & Family Fun, to show off one of our upcoming releases, Junk Orbit. Demoing the game for an entire store might seem intimidating, but it was great practice for the event we had planned for Wednesday night - a simultaneous demo of Junk Orbit to a group of 200 retailers! Of course, Sara’s done this once or twice before, so everyone had a great time learning and playing. Scott and I arrived Wednesday afternoon, just in time to attend the boat cruise that ACD puts on for the publishers exhibiting at the show. It’s a nice moment to spend with peers before the hectic nonstop action that is the rest of the show. Once we docked, it was time to tune our brains back into game mode and prep for the Junk Orbit demo event! Fortunately, the ACD sales staff is awesome and helped us throw games and promos on every table while we set up our presentation. Retailers filled tables as soon as we opened the doors and the volume in the room rose with excited chatter. We shuffled some people around to make complete games, then we got down to business! Game Boy Geek did a great job with his Rules School video. We played it for the entire crowd and they quickly jumped into gameplay. The ACD sales staff was still awesome and helped answer any questions that retailers still had after the video (which wasn’t many!). Abby answering questions like a boss! After we wrapped up the event, we three Renegades headed out to grab a bite to eat (tacos, because that’s always the right answer). We discussed our plans for the show, shared stories of times passed, and, most importantly, laughed together. After our bellies were full, we headed to bed to rest up for the big day of the show! We met bright and early to finish setting up the booth while the retailers attended seminars given by their peers and other publishers. After resolving one snafu involving a missing box of games, the booth came together. It looked pretty darn good, if I do say so myself! Sara took off for a bit to meet with the ACD Sales Team and show off our exciting upcoming titles and programs. Scott and I took a moment to walk around the sales floor while all was still calm and booths were still half put-together. It’s always interesting to see how different publishers arrange their product in their space and how they decorate. We were inspired by elements in a few different booths! Hopefully you’ll see them incorporated into our booths in the near future! Sara stares down Scott with such super seriousness; it was scary. With our Renegade powers combined we finished all of the necessary tasks with a couple hours before the Exhibit Hall was scheduled to open. We headed to a nearby brunch place to get some work done and fuel up for the nonstop energy required for the booth. It was during this #BusinessBrunch that we announced the upcoming Clank! In! Space! Apocalypse! (yay! exclamation! points!). We made it back to the booth in time to get settled before the doors opened and retailers streamed in. The team showed off some of our classic titles, but had our upcoming releases displayed as well. One of our favorite designers and Madison local, Kane Klenko, also joined us at the booth! He helped demo two of his games - FUSE and Flip Ships. 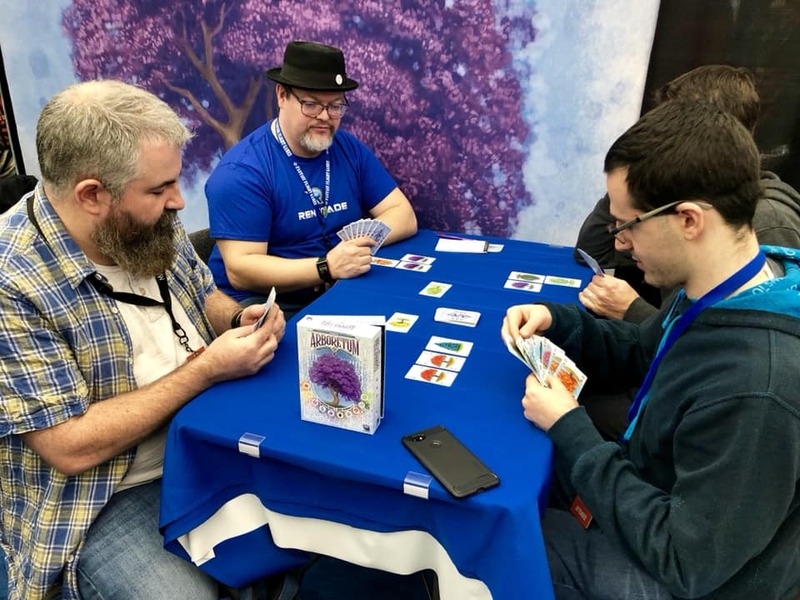 Steve Ellis, one of the designers of The Tea Dragon Society, momentarily turned in his retailer hat to explain his upcoming release to curious booth visitors. While everyone enjoyed dinner, the ACD team was flipping the Exhibit Hall to fill it with tables for demo night! We had a few titles we were showcasing. Lucidity, The Tea Dragon Society, and FUSE had players in seats all through the night, even after the event was officially over! Overall, the event was a huge success for us and we had fun participating! The next morning, Sara was scheduled to give a presentation to retailers. She focused on all the exciting titles we’ll be releasing for the rest of the year (spoiler alert: there are a lot!) and how retailers can easily add them to their shelves. Some good discussion flowered from her presentation and the energy in the room was positive and engaged. Mission accomplished! After seminars wrapped up, everyone headed to the ACD warehouse for shopping and food! This is always a super fun time for everyone and a great way to close the show. We sat with new and old friends, shared a meal and conversation, then walked around the warehouse helping people find our games, and picked up a few treasures for our own shelves. One of us may have had too much cake (it was totally me), but we left better for having attended and everyone made it home safely! A bunch of Renegades in downtown Madison, WI. Our next show is Origins Game Fair in Columbus, OH from June 13-17. We will be at booth #913 and have the titles mentioned above (and many more!) available for demo and purchase. Some of them even have promos, too! You are able to reserve your copies of our hot new titles now by preordering and selecting "Origins Pick Up". Hope to see you there, but if you can’t make it, look forward to another post-event blog. Renegade Society Radio With Overlight Designers! San Diego, CA (April 26th, 2018 ) To celebrate the launch of Overlight on Kickstarter, designers Paul Alexander Butler and George Holland joined us for our bi-weekly Renegade Society Radio live steam last night! Find out about Renegade's first ever Kickstarter project and our latest RPG project Overlight, straight from the creators! 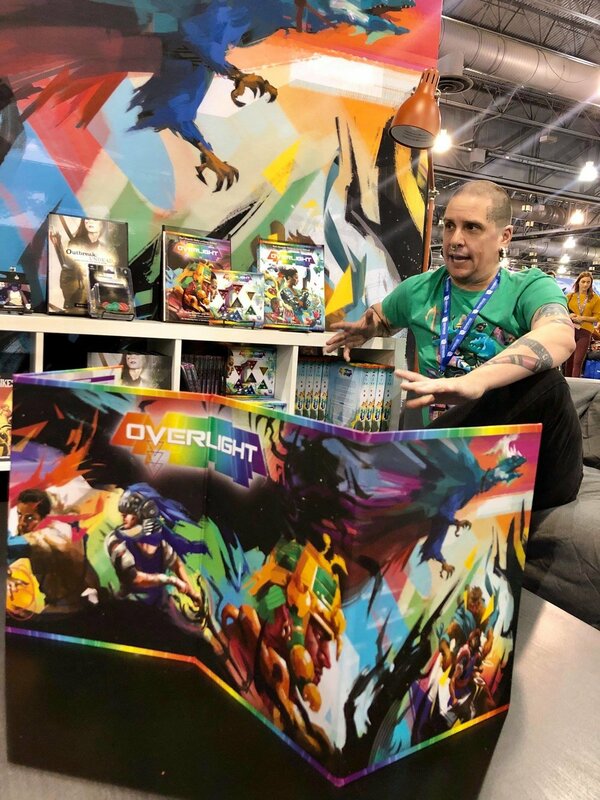 Paul and George show off Overlight at the GAMA Trade Show! New Miniatures Line coming soon! Tiny games for crowded shelves. San Diego, CA (April 1st, 2018) Renegade Game Studios is excited to reveal a new line of games to their catalog, Miniature Games. Each game in this new series will be identical to their full-sized counterparts but will be approximately 1/4 the size in every dimension. Premiering at Gen Con, these games will also include an optional accessory kit that offers tools to help fans take full advantage of their new tiny games. "Everything is cuter when it's tiny," explains Marty from the Rolling Dice & Taking Names Podcast. 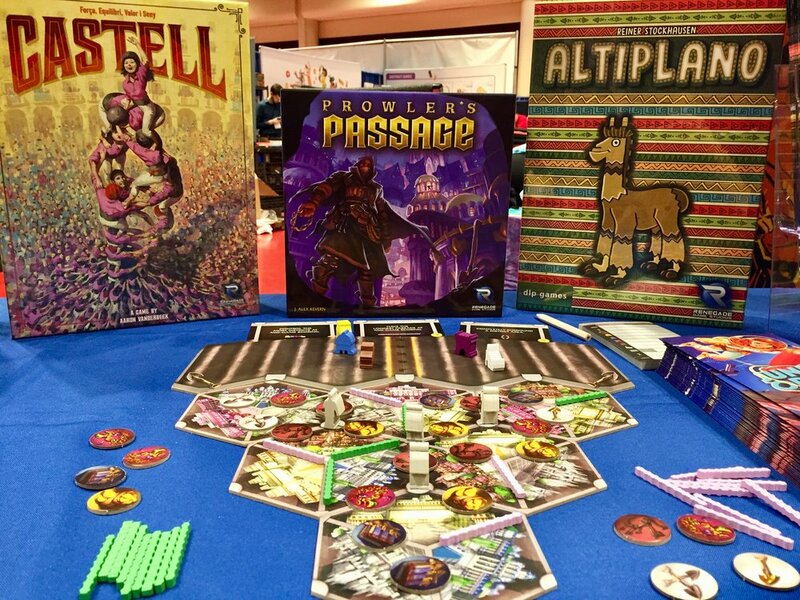 “As a retailer, I think this is a brilliant idea,” states Travis Severance of Millennium Games. “I just can’t carry all the full-sized games anymore even though I have a relatively massive store. With this improved box size, I think Miniature Games from Renegade are going to usher in a new era in board gaming. "I value efficiency in my life and these new Miniature games fit perfectly!" comments Mandi from To Die For Games. 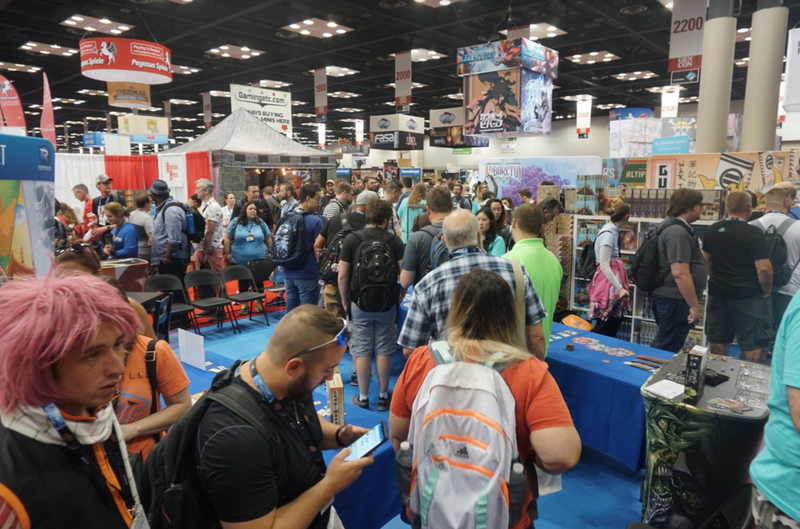 Fans will get their first look at these bite-sized games during the Gen Con, Aug. 2nd – 5th. Accessory kits will include tweezers, magnifying lenses, and magnetic tools that allow fans to easily interact with their games while improving their coordination skills. Stay tuned for more information about the new Renegade Game Studios Miniature Line and more by joining the Renegade Society today! Each year, we spend a week with friendly game store owners, teaching them games and sharing upcoming info! Enjoy this fun photo blog of the event and stop by our facebook page for more photos! Hundreds of retailers played Topiary with designer, and Reno local, Danny Devine! After viewing some pleasant gardens, they battled nightmares in Lucidity! Perhaps the biggest event was RPG Night! Special guest GMs Ivan Van Norman, Paul Alexander Butler, and George Holland taught retailers how to play Kids on Bikes andOverlight! At Board Game Demo Night, we previewed International TableTop Day exclusive Wonderland and taught players the safest version of human tower building with Castell! Make sure you check out last week's episode of Renegade Society Radio! We had special guest Ivan Van Norman, LIVE from GAMA! A photo could last forever so we want to make the best one possible. Perhaps this New Year you can start taking better quality photographs. It is important to know some technical details to make a perfect composition and reading the light. This is a quick jump start to understanding photography and some tips on how to make a good photo great. Everyone seems to have a camera on-hand at all times. You have a cell phone in your pocket that you can adjust settings to in the camera itself. Perhaps you have a Digital Single Lens Reflex camera, also more widely known as a DSLR, and these cameras offer even more settings and options when shooting. The first thing you need to do is grab a camera! Knowing and seeing the light patterns will help to capture the moment at hand. Photography is all about the light and having a good image would suggest the image is neither too dark nor too bright. If it is light outside you can simply use window light to capture your gaming images. More often than not I am gaming at night when it is dark outside and I would require additional light from a flash. This image is using window light and you can see by the soft shadows the light produces. Using a flash properly will help make your photos pop with color and vibrancy. If using a DSLR, there should be an option to mount a flash to the top. If you have a detachable flash that is great! Whenever using a flash you never want to point the flash directly at the subject matter. The light source should bounce off the walls or ceiling onto the subject. If this is not an option you can also diffuse the light. For the flash on a DSLR that automatically pops up, you can use a white ping pong ball. Simply cut it in half and that can cover the flash pretty well. If you are using your cell phone, you can use some masking tape to help diffuse the harsh light. Looking at an image, you want to distinguish a ‘true white’ and a ‘true black’. If you can do this than you will have a good contrast so the colors don’t look muted or muddy. Having appropriate contest will help your image stand out from the rest.The best tool for doing this is a histogram. You can find a histogram on a DSLR camera, or in a photo editing application for your computer, or phone app. If you have access to a histogram you want to have the perfect range of colors from the blackest black to the whitest white. In the 3 images below, you can view the histogram on the top right hand side of the image. When the levels are more towards the left it means it is under exposed, when they are evenly placed with a left and right most level then it is an accurate exposure, and when it is mostly towards the right hand side then it is over-exposed. By taking the proper time to evaluate your images, I think you will be pleasantly surprised by the results. Thanks for taking the time to learn a bit more about photography! We hope you found this useful. Games and Baking - Serving Pie with your Pie Town! Planning a holiday get-together? Today we’ll show you a fool-proof way to bake a delicious pie for the gaming crowd. 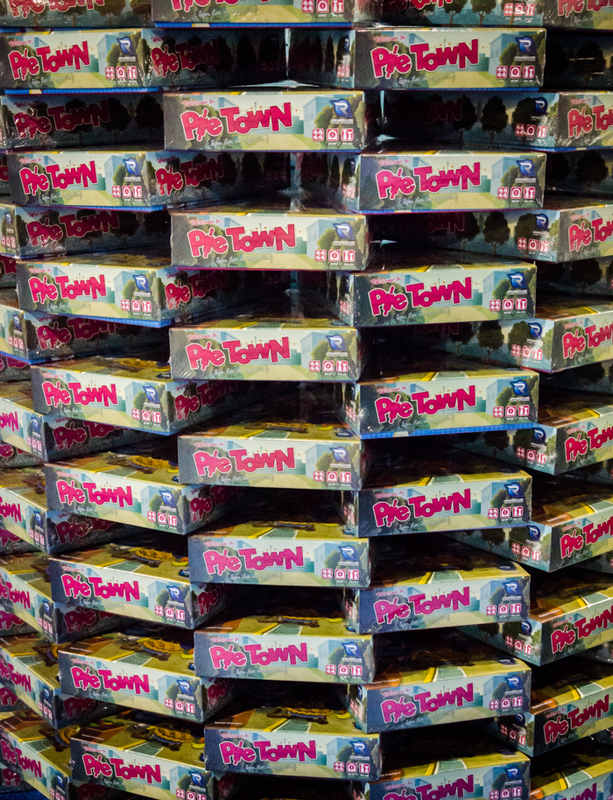 While it bakes, treat yourself to a game of Pie Town! If you’re in a hurry for your pie or already feeling like this looks like way too much work, skip straight to step 4 and see how Sara Erickson enjoys her pie! 1) Follow the heating and cooking directions on the back of the can and turn on your oven. I preheated the oven to 425 degrees F.
2) Carefully unroll one of your pie crusts and mold it gently into the pie pan. There should be some extra crust hanging over the sides. 4) Here’s the exciting part: use your can opener to open your can of pie filling and dump all that yumminess right into the pan. Or, follow Sara Erickson’s advice and forget about the pie crust altogether. Skip straight to this step and eat the pie filling straight out of the can! Pie making complete! 5) Now, you could roll out your second crust, plop it straight onto the top of your pie, cut a few slits in it, and call it good. Or…you can be adventurous and use your mad cutting skills to impress your friends with your basket weaving technique. Roll out that second crust and grab a ruler and a pizza cutter. Use your tools to cut the crust into ½ inch wide strips. 6) Place the strips across the pie as shown all in one direction with about ½ inch between them. Fold back half the strips and then place another strip perpendicular to the first ones. 7) Fold the strips back over the new strip of dough. Continue folding back half the strips, placing a new strip across, and weaving the top of your crust. 8) Before too long, ta-da! Your basket weave is complete! Now, cut the excess dough off the ends of the strips. 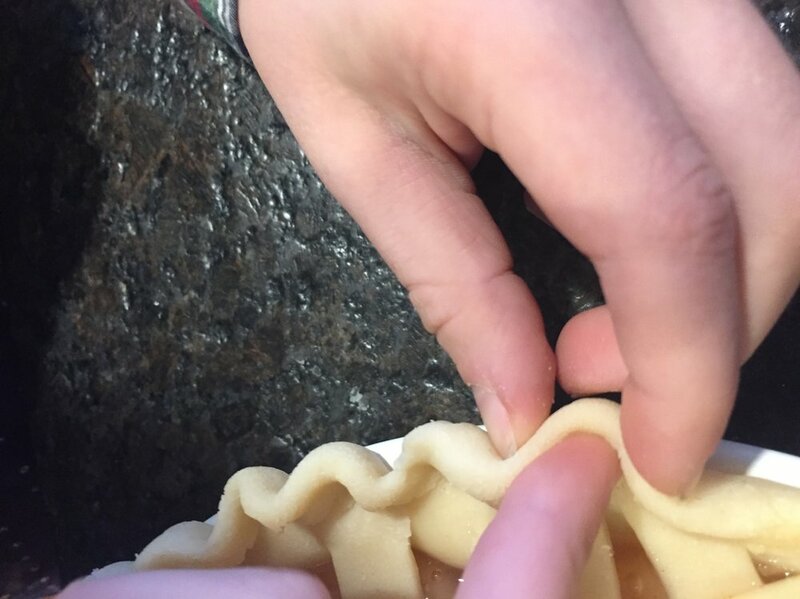 9) Roll the edges up, squeezing the dough as you roll to make a nice tight seal around the edges of your pie. 10) Finally, use an index finger from one hand and your thumb and index finger on the other hand to create a beautiful finished edge for the crust. 11) Brush the top of your pie with more egg white, and pop it in the oven for 45-50 minutes. Open up Pie Town and play while the air fills with the aroma of home baked pie. 12) Peek in the oven after 20 minutes or so. If the edges of the crust look like they’re going to burn, you can cover just the very edges of the crust with aluminum foil. Let it continue baking until the top is golden brown and the filling is bubbly. Take your amazing homemade pie out and let it cool for a bit before enjoying! 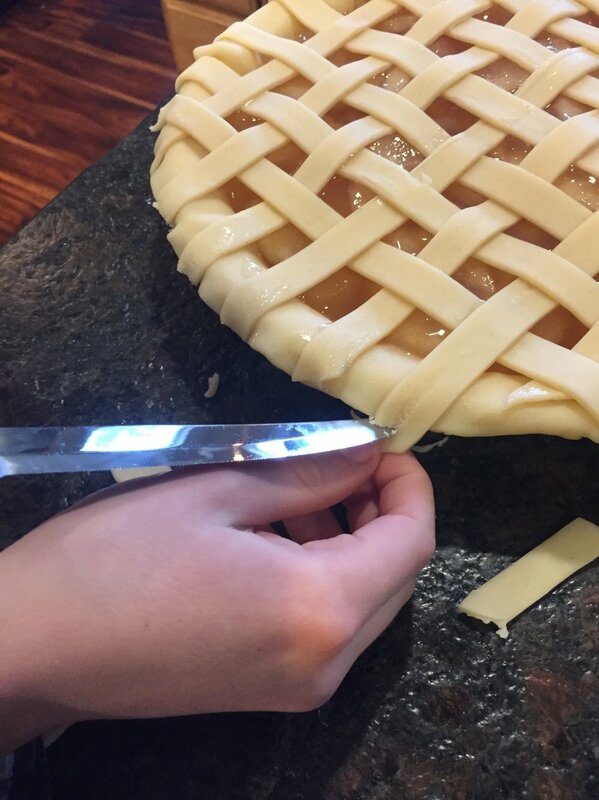 Tip: For an even simpler but still impressive crust, just cut holes in the top crust using cookie cutters before you place the crust on top of the pie! Using a spoon instead of your index finger when crimpling the edges gives a nice consistent finish. Serve with a side of Pie Town. Enjoy! 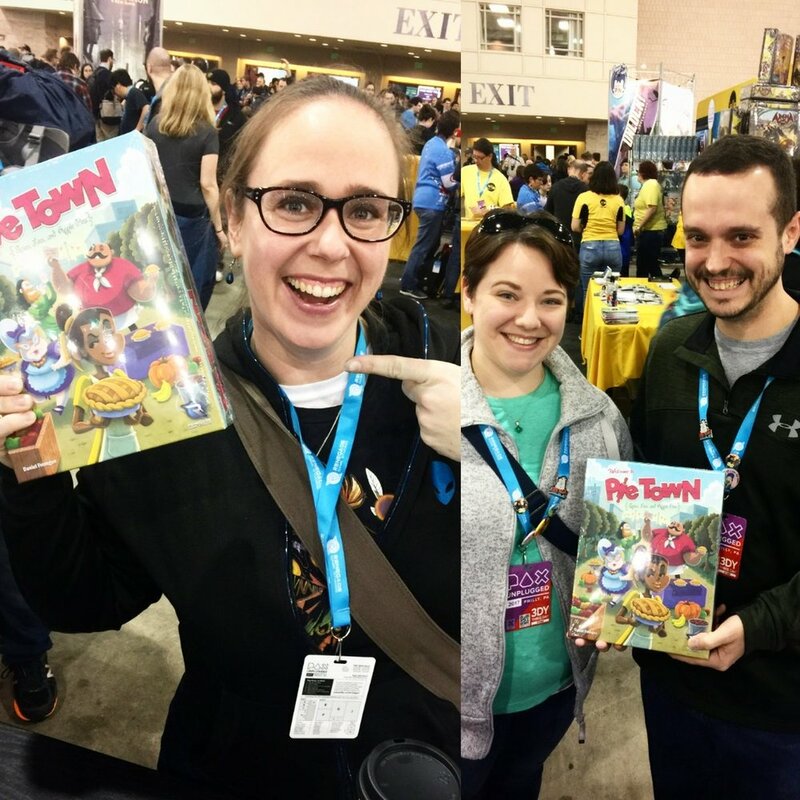 This past weekend Renegade Games Studios attended a new convention called Pax Unplugged, in Philadelphia, PA! PAX host several events thought the year and is primarily a video game convention, but they expanded to have its own tabletop edition. 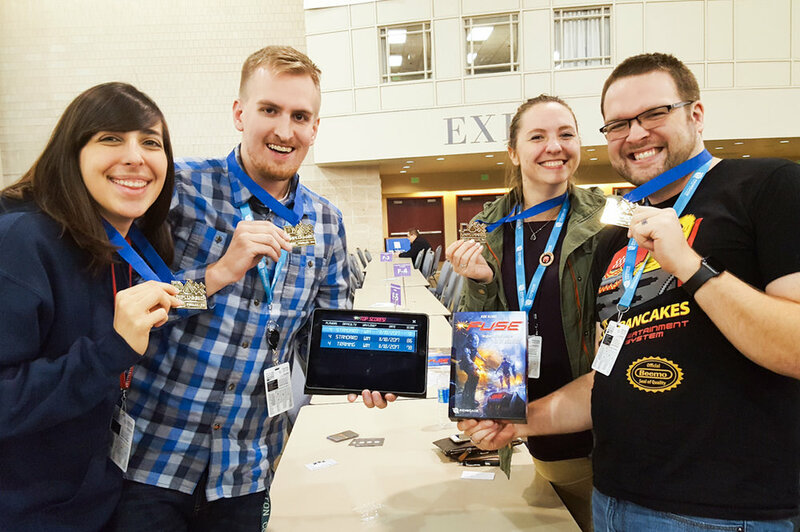 As a board game publisher, we were super excited for this opportunity to join a new convention and invite new and veteran gamers to play our titles! Renegade Game Studios was proud to debut Pie Town, Kepler-3042, Planet Defenders, Shipwrights and Explorers of the North Sea this convention. Their scheduled releases to be mid December 2017! Check your local retailer for preorders today! Wednesday night we had a scheduled event at Family Fun Hobbies in NJ, which is about an hour outside of Philly. This was great we had a bunch of tables going with gamers learning and playing Renegade games! We were teaching the new Pie Town! Set to hit stores December 13, 2017, this is a dice worker-placement game. 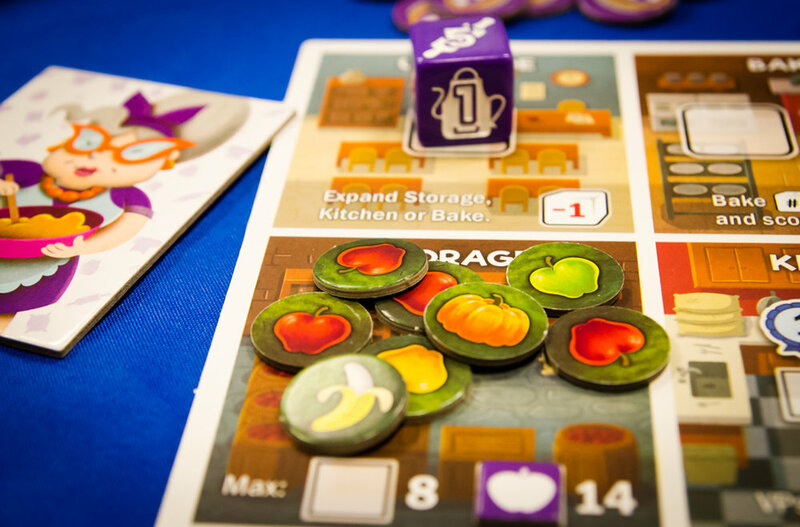 You never roll the dice but you are using them to collect apples and other specialty ingredients to try and make the best pies! You have a secret pie that others are trying to deduce to steal your recipe. As you take actions you are leveling your strength and will get better actions as the game progresses. We had an amazing time and met some great fans! It was fun to see them again during the convention as well! Thursday was the official set up for our booth. Since our booth was ginormous we actually had to wait for the union laborers to set it up. While we waited for them we got to play some games with the demo team! We had a few different tables going on but with a focused learning game of Kepler-3042. This is one of our new titles and wanted to make sure we had appropriate candidates to demo this during the con. In Kepler-3042 you are choosing an action each turn to help gather resources, improve your technologies, explore the Galaxy to discover new planets and maybe colonize them if you traveled far enough. With your own personal pool of resources you have to manage the supplies wisely throughout the game. Explorers of the North Sea was another one being played. This is the 3rd game in the North Sea Trilogy. The first is Shipwrights of the North Sea followed by Raiders of the North Sea. In Explorers each Viking team is branching out into the sea to try and find colonies and search the lands to collect livestock and build outposts. With several ways of collecting victory points you can focus on a particular avenue and go for it. You will be placing a tile down each turn expanding the board and creating a unique map of water passageways and different islands. Before heading to dinner Matt from the Demo team had an amazing surprise for us. With Pie Town being a new release, he found it appropriate to share small Pies with everyone on the team!! Amazingly generous and delicious! We had to grab a photo of those amazing pies! Back at the hotel there was a quick game of Topiary being played! This game set to release Q1 By Renegade Game Studios! Topiary is a super fast tile placement game where you are placing Meeples on rows and columns to see beautiful Topiaries. You get points depending on what you can see and the heights of the bushes. We all had a great time! Friday was the first official day of the convention. We were there bright eyed and bushy tailed waiting for the excitement. This was our amazing demo team!! We had several scheduled events this convention! Our first event of the con was a Clank! Tournament. Some players were new to Clank! while some had played before. The winners of each game got to play again in a finals and the winner received a PAX medal! Another awesome event was the industry panel. Scott Gaeta [President, Renegade Game Studios], Justin Ziran [President, WizKids], Mike Webb [VP Customer Service, Alliance Game Distributors], Travis Severance [Owner, Millennium Games], Tom Vasel [Owner, The Dice Tower], Richard Ankney [Game Trade Media] was the MC. During the hour there were a lot of current board game insights and anticipated projections for the future being discussed. Hearing for the retailer, distributor, publishers, and media is eye opening and thoughtful. They discussed topics including creating and maintaining demand at retail stores, designing games for the current market, and the responsibilities of professionals in the industry . Everyone had a say in their opinion on Kickstarters and how that it is its own entity. Kickstarter is a tool that can help bring to life new and interesting ideas, but can be a challenge for hobby retailers. It finalized with an overall consensus that the board game industry is at its all time high and still shows to be a growing market. More and more gamers every year which means more and more games are being produced. The top quality we are getting in our boxes today are setting the standard for what a board game should be and what is expected. Who knows when, but there will be a plateau, but as we are seeing it, we are at the best of times! Saturday was another day full of events to attend and the one day that the con completely sold out. The booth was busy and the people were happy. We had a few Guest designers show their games at our booth. 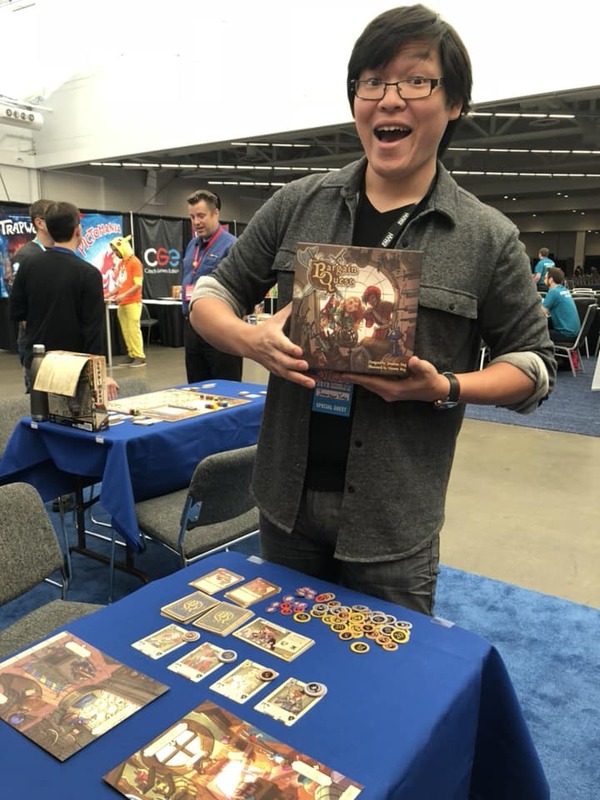 We had Nate Bivins the designer of Sundae Split, David Wilkinson, Designer of Castles of Caladale, and Christopher Chung the designer of Lanterns: The Harvest Festival! Late at night was a Fuse Tournament! This was a best score out of 3 games. Our new Marketing Coordinator, Steph Hodge had never played FUSE so she jumped in with one of the teams. She had a great time playing this intense real time game! The winning team was amazing and defused all the bombs first each round. They all had a great time and the victorious team was caught on camera with these huge smiles and their luxurious Pax Medals for winning the tournament! Sunday was the final day of the convention and more family focused. Mandi Board Game Pin-up Girl of the Dice Tower hosted a special Renegade event, Family Games 2.0, catering to this family centric crowd! This was a super awesome time for families to come together and learn some our our titles. Mandi still had her voice after demoing for the 2 days prior, but was an amazing teacher and mentor for everyone. This was a 2 hour event and she taught Sundae Split, Lotus, and Dragons Hoard! Once the event was over, the families got to keep the games they just learned and we snapped a group photo! It is so rewarding to see such joy from kids and parents when playing and enjoying our games! We had one final event we hosted and taught Flip Ships! This game was also a huge success and there are always so many smiles and laughs when playing this dexterity game. Over the weekend we had an on-going social media contest. Pax attendees were asked to post a photo of them at the Renegade booth to Instagram @renegade_game_studios and Twitter @playrenegade. I announced 2 winners which were random picks and they each won a copy of Pie Town!! It was a great contest and we were happy to find homes for more pie! The hall closed at 6pm and we had demo tables still going up until the final moments. It is safe to say we had a wonderful time showing off the games and meeting so many amazing people. We found there were a lot of new gamers and they were eager to see what kinds of games we had. Over the weekend we saw several of the same faces coming back more and more to try each of the different demos we had set up. All in all, we had a great time and look forward to seeing how this con can grow in time and we hope to be back for the next one in 2018! 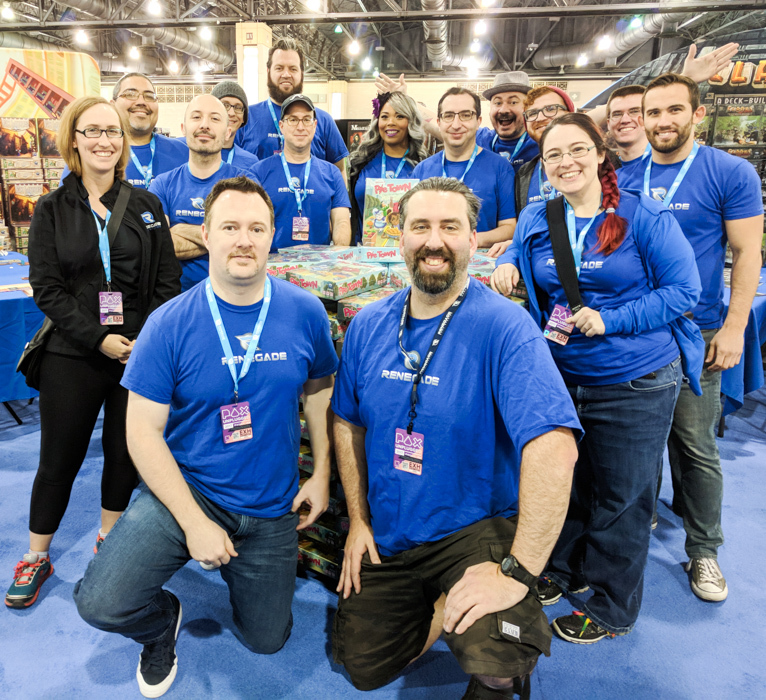 We hope you enjoyed this recap from PAX Unplugged. From everyone on the Renegade Team, we appreciate your continued enthusiasm for our titles look forward to seeing you at an event in 2018! If you wish to see more photography from the event please go here! August is the month for conventions and give aways! We are attending GenCon and PAX this month and we want to invite you to join us at those events. If you can't attend, please check out all the neat ways we have for you to participate from home! Lots of great news coming out soon about future projects! Be sure to follow along! Renegade at Gen Con 50! Join us at our booth, our event space, and Dire Wolf’s booth for demos of our games! Prizes will be given away and who knows? You might even leave with some promos! Keep reading to find out what we have going on for Gen Con! No need to pre-register, just show up and play! Check out these sweet Flip Ship coasters and Renegade Meeples! Demo games to win free swag! Learn new games at our booth to collect all our beautiful badge ribbons! Add some flair to your badge and show your love for your favorite games. These will be limited! 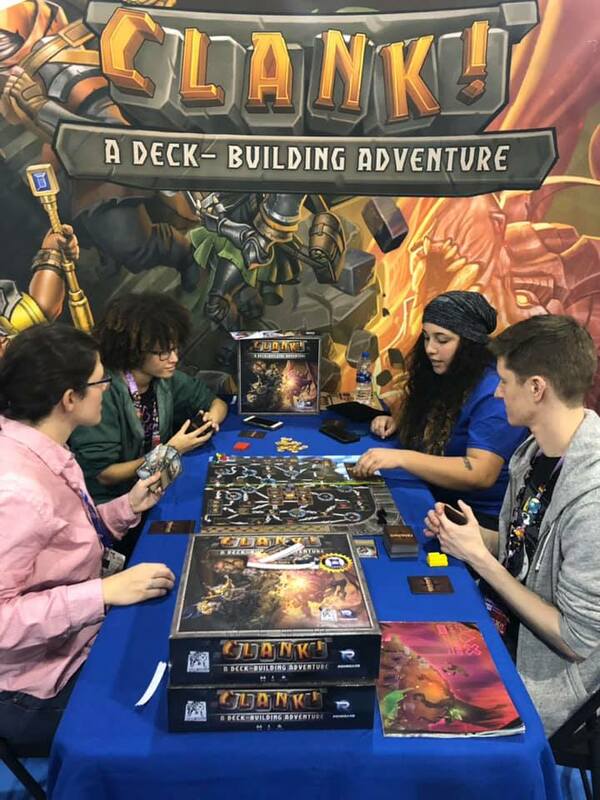 Throughout Gen Con, we will hold daily tournaments for Clank! as well as learn to play sessions of our hottest games! Join us in the event hall for open play and demo events!. Everyone who plays in the Clank events will receive a Siren Promo and a random play in each event will take home a Golden Dragon. Be the stealthiest adventurer of the day to take home one of these sweet trophies! Check out our Clank! Tournament trophies! These things are hot! Can’t get into a tournament? Friendly local game stores everywhere can order the Summer OP kit now which includes Golden Dragons and Siren promos. Ask your local store today! Are you a local area gamer that missed out on a Badge? Preview Gen Con at your favorite local game store. Join Family Time Games as they host a Renegade Game Meetup at 6:00 pm on Monday August 14th and demo a few games such as Raiders of the North Sea, Sentient and Scott Pilgrim's Precious Little Card Game! Meet Scott and Sara and ask them all your burning Renegade questions! You can find more Renegade titles on our website! · Kane Klenko (Flip Ships, Flatline, FUSE, Covert designer): 10:00am - 6:00 pm Daily (Excluding Lunch Breaks) 17th - 20th. · J. Alex Kevern (Sentient, World’s Fair, Atlas: Enchanted Lands designer): 11:00 am - 1:00 pm Friday, 17th and 3 - 4 pm on Saturday, 18th. Attendees can take a selfie with the life-size dragon to post online! Using #GenClank, you will be automatically entered into a drawing for a copy of any Clank! product you choose! Make some noise Clank! fans! Also, stop by to give a hug to the most lovable pooch at the convention at our Aza Chen corner! Don’t feel left out! Fans at home can take a photo with any dragon (preferably the Clank! meeple) for a chance to enter too! Stay up to date during Gen Con by following us on Facebook, Twitter, and Instagram! Loving the artwork from Castles of Caladale? Have you ever needed to keep some members of your group busy while others figure out a new game? The whimsical artwork from Castles of Caladale recently inspired this young artist. While the oldest child was reading the rules, and the middle kid was punching out and stacking up tiles, the youngest member of the family was thrilled to have her own important job. This little one found an empty chipboard sheet and began creating some artwork of her own. Before she was done coloring, the game was set up and rules were read. She was able to jump right into the game with us, and start building her castle. When the game was over, points had been totaled, and a winner declared, she jumped right back into drawing her own version of the game, with kitties, foxes and puppies. Next time you’re opening a new game, try creating your own canvas by taping a blank piece of paper to the back of the empty cardboard. The punchboard creates lovely frames for a cartoon or individual small drawings. We found that the round holes left from punching out a copy of Shibu Inu House made perfect circles for funny faces. You could encourage a child to cut the pieces out and incorporate them into a game, or leave them together and hang them on a fridge. We like to staple a few sheets of these together into a book. This little one had a wonderful time giving her parents and older siblings assignments, telling us what to color in the frames she made for us. For the square boards of Castles of Caladale, she instructed us to fill one box with a cat, another would be a monster, etc. My personal favorite is the star she turned into a fox. Weather sorting cards, punching out pieces, or pulling plastic off of decks of cards, opening a new game provides many opportunities for even the youngest family members to be excited and engaged. Whatever you do with it, enjoy the process, maybe pick up a pencil yourself, and let your imagination flow with childlike wonder. Jenni is Renegade's Customer Service Expert, a stay at home mom for three lovely children, and a crafty gamer! Origins Game Fair - Renegade Preview! 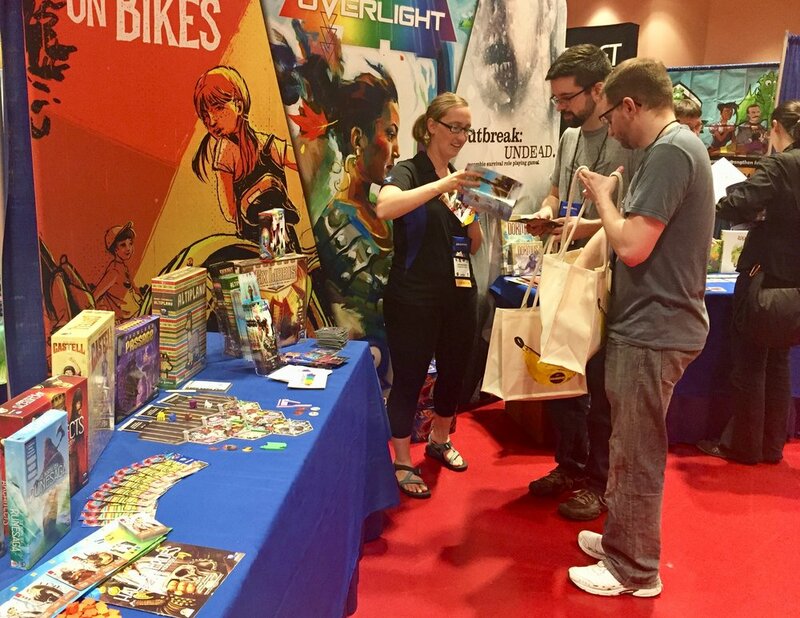 Origins Game Fair in Columbus, Ohio is one of our favorite events of the year. We spend time with our fans, meet with our incredible designers & artists, and celebrate with our fellow publishers at the Origins Awards Ceremony. It’s always a great week and we wanted to share a bit of what we have planned. We also have a few recent releases we’ll be featuring on the booth. Both FLATLINE and Honshu released in May and have already received high praise from the review community. We are completely sold out of FLATLINE with the exception of these few copies we saved for Origins. This challenging game from Kane Klenko, the designer of FUSE, will push your team to the limits while you save patients in the medical bay of your starship. Our demo team will be on hand to run you through the basics! We have been honored with three nominations this year and we would love your vote! We’re hosting a ton of exciting events at Origins! Learn our new games and compete for the title of Best Adventurer in our Clank! Make Some Noise! Events! Sign up or show up to see if we have empty spots. For most of our events, players will receive a raffle ticket just for playing, the winner of the raffle will receive a copy of the game! Players that enter our Clank! events, we will be recording the high score from each game. At the end of the Fair, the player with the highest score will receive a handcrafted Dragon trophy. It will look so good on your gaming shelf! We will also have participation prizes for everyone who joins us. Here's a list of all our events! Looking for something to do after the Exhibit Hall closes? There are still tons of events, great food, and more friends to meet after hours! Keep reading for a few ideas! We play games to be social, meet new people, and spend time connecting. We wanted to set aside some special time to connect with you away from the hustle and bustle of the show floor. Our friends at the beautiful Tabletop Game Cafe have invited us to share their space for an evening of games and goodies! Please make sure to RSVP here! Still looking for a place to play games and make the world a better place? Nerd Night is hosted by some of the most caring folks in the industry and they put on a wonderful event every year to generate donations for a special organization. This year they will be donating to the Columbus Nationwide Children’s Hospital. It’s a worthwhile cause and a lot of fun. We’ll be donating some prizes to their auction that you will not want to miss. RSVP here! One of our favorite podcasts, The Secret Cabal, hosts a huge meet up at a nearby restaurant each year. We have sent them some fun and silly prizes to support this event. Stop by and say hi! More info here! Whatever you choose to do at Origins, have a blast and please do stop by the booth to say hi! I recently had the privilege of spending a week in San Diego with Renegade Games for the Renegade Summit. It was a fabulous week of play testing prototypes and eating pie from Julian’s. My deepest thanks to Scott Gaeta (and his family) and Sara Erickson for being wonderful hosts and including me in this excellent board gaming extravaganza. Piles of prototypes ready to be tested during the Renegade Summit! The concentrated play test time meant I had a concentrated time of fun… and frustration. I played games with engaging and unique themes and intriguing and interactive mechanisms. I also spent a lot of time agonizing over rules inconsistencies, confusing components, and even had to put some games aside because they were too difficult to get set up. There's a lot to dig through below, you might want to grab some pie to enjoy while you read the rest of the post. Remove any barriers that hinder people from playing and enjoying the game. Send a playable prototype. As Scott Gaeta says, “I don’t like to do arts and crafts.” Without a doubt there are a lot of people who love doing Print and Plays…printing up pages of cards, cutting, sleeving, even printing out boards. But when submitting to a publisher, don’t count on their ability or willingness to do that work. Whether you hand craft a prototype on printer paper with wingding icons or pay a print-on-demand service to produce a polished game, give the play tester something they can simply open and put on the table. Art isn’t necessary but… it can help make the game more memorable. This is especially valuable when a lot of prototypes are being played in short order (i.e. an UnPub, Protospiel, design competition, or publisher evaluation blitz.) While I wouldn’t advise investing in expensive custom art for a prototype, just try to do small reasonable things to make your game stand out. Does the game need a player aid? Most benefit from one. Include it! A list of available actions, game phases, or scoring conditions are all helpful things for play testers to have in front of them. Include a detailed component list. Since prototypes often use parts gathered from other games, make sure it’s obvious what those components are for in your game. Sort the components into labeled baggies. This helps for out-of-the-box start up and it sets a really positive tone as players set up the game. Put a component list in the box that includes photos of the components. A list is great, but an illustrated list is ideal. A sheet that shows a photo of the component, component count, and what it is in your game is hugely helpful. Rules. Oh rules. There are many people far more skilled at assessing rules than I. But, play testing so many games made it abundantly clear why publishers hire professional rules editors. I think the key challenge with rules is that the game designer who is writing them is the person most intimate with the ins and outs of the game. This easily leads to assuming key information as a given, meaning it doesn’t get defined in the rules… and leaves the unfamiliar play tester in a lurch. Include game setup instructions. This makes it easier and faster to get the game to the table. Ideally, show a photo of the prototype set up. But any notes on where the components belong when you start play are helpful. Give examples. Specific examples are immensely helpful in clarifying vaguely written rules. Movement, battle, exchanges… everything can be made clearer with examples. They can also reinforce rules are being interpreted correctly. And if your game has complex scoring? Include examples of that too! Version the rules. If you’re loading rules to BoardGameGeek.com (or including multiple rule sets in the box) make sure they’re versioned. And do you best to submit a consolidated “best of” rule set with your prototype. It’s an awkward experience to have to reference the movement rules from an older ruleset but the battle rules from the current ruleset…especially when those rulesets aren’t labeled well. Include card diagrams. If your game uses cards with multiple elements on it like damage, defense, cost, value, etc. include a labeled picture of the cards. Without a visual reference, it’s incredibly challenging for a new player to figure out what the different things on the card are for. Be specific with words. “Number” can mean a few things in a game. The count of the card? The value of the card? Use terms consistently and do your best to use distinct words for elements that could be confused for each other. 6. And finally, don’t forget to include a tiebreaker. ‘Nuff said. Thank you so much to all the creative designers out there working hard to make awesome games. I cannot calculate the passion, effort, time, and stress of designing a game and the guts it takes to submit a prototype. Before the Renegade Summit, I never considered myself a playtester, but I now look forward to my next opportunity to do so. If you are interested in submitting a game to Renegade Games, please check out the Submissions page. Hope you enjoyed the article as much as we enjoyed our week at the Renegade Summit. We look forward to seeing final versions of these incredible games we tested this week! Suzanne Sheldon is a board game and social media enthusiast. She is part of the Dice Tower Network team and a regular on Board Game Breakfast. Suzanne also coordinates the annual #GenCant event (the unconventional unconvention for those who can’t Gen Con.) Suzanne lives in the Seattle, WA area with her non-gaming husband and her two children who, thankfully, love games.